Now that you’ve bought an air fryer, you’re excited about the culinary possibilities, but you’ve encountered some problems. The first few foods that you prepared lacked crispiness, and some food stuck to the basket. These weren’t disasters, but you want better results. The Solution? Spritz with Oil for Crispier Foods! When Should I Use Oil? Here we’re going to talk about 4 of the best oil sprayers. Having an oil sprayer not only makes cooking easier, but it also helps the food get more crispy and brown. Cooks appreciate the sleek and attractive aluminum exterior of this sprayer that has been popular for years. It applies a fine spray of oil or other liquids. It provides full control of the amount of spray used on food. The manufacturer backs up all parts with a no-cost replacement warranty. It contains up to 1/2 cup of oil. You only fill it halfway because the remaining space is pressurized with the pump action. You pump it until you feel resistance. As the container empties, you’ll need to pump more to maintain appropriate pressure. Be sure to unscrew ring and release pressure after use. Mister is cleaned with warm sudsy water in the sink. Fill it with soapy water and then spray. Repeat the process with just water to rinse it. 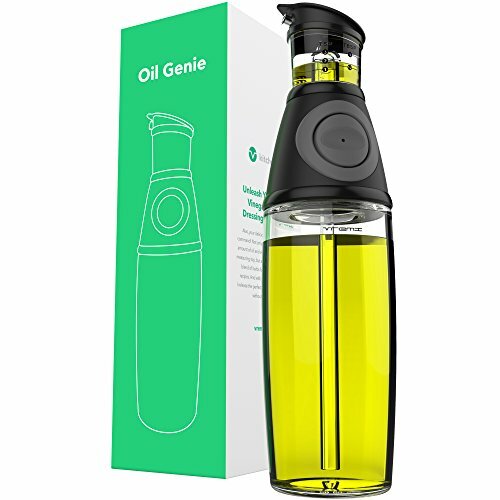 Designed for cooks using air fryers or anyone watching fat content in the diet, this product has a BPA-free plastic oil chamber. Because it’s not fragile glass, you don’t have to worry about breaking it if you’re cooking on a patio. At just over 6 inches tall, it’s small enough if you’re packing it in the RV. Like other misters, you have full control of selecting oils. You’ll like the clear chamber because it lets you see how much oil that you’ve used. Its very fine spray produces good results in air fryers. Although this product has a higher price than other misters, users have reported that it has easy pump action, is easy to clean, and does not clog. This product uses a trigger to expel a spray of oil or vinegar. It’s an appealing alternative to pump-action sprayers. The Michael Graves Design Group created an ergonomic form that works comfortably in your hand. Sprayer also comes with a funnel to assist with filling. The materials within the product are free of latex, BPA, and DEHP. The bottle is safe to put in the dishwasher, but the sprayer mechanism needs to be hand washed. The product is built to resist breaking or clogging. Its fan-shaped spray places a thin amount of oil across the food. Each pull of the trigger expels 1.35 ml of liquid. Cooks report great control over the amount of oil that they put on food. The glass chamber of this product eliminates any concerns about storing oil in a plastic container. A distinguishing feature of the Vremi is its measuring mechanism. It allows you to choose a teaspoon or tablespoon or measure in milliliters. This feature helps you reduce oil consumption because you won’t be guessing at oil amounts when you’re cooking. You won’t have to deal with any messy drips with its no-drip pouring design. To create pressure in the bottle, you press a silicone pumping button. You might like its large 17-ounce capacity. You won’t have to go through filling it as often as smaller sprayers. The glass bottle is dishwasher safe, but, like most sprayers, you’ll need to hand wash the other parts. An oil sprayer will deliver additional benefits beyond protecting you from unwanted ingredients. With a mister, you’re certain to prevent sticking. You’ll get oil across the entire surface of the pan. 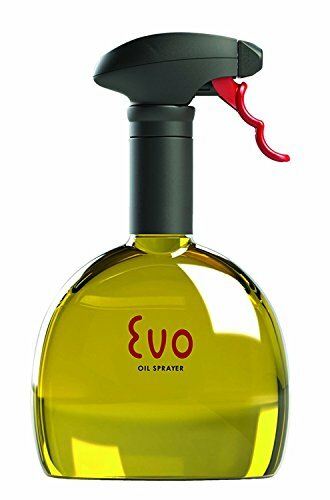 An oil mister also makes it easy to apply a second spritz of oil when recipes call for more oil in the middle of cooking. Because cooking spray cans cannot be refilled, you’ll be throwing them away and buying new ones all of the time. A refillable oil sprayer reduces waste and prevents endless purchases. You’re in control of oil selection when you have an oil sprayer. Your mister will work with any plant-based oils, and you can always select oils without chemical additives. An air fryer can prepare foods that would normally go in a deep fryer. Spraying foods like fries or onion rings with oil allows the intense circulating heat of the machine to cook a crisp exterior and tender interior. Most recipes only call for about 1 tablespoon of oil, which is best applied with a mister. Fatty foods, like bacon, won’t need you to add any oil. Leaner meats, however, will need some oiling to keep them from sticking to the pan. 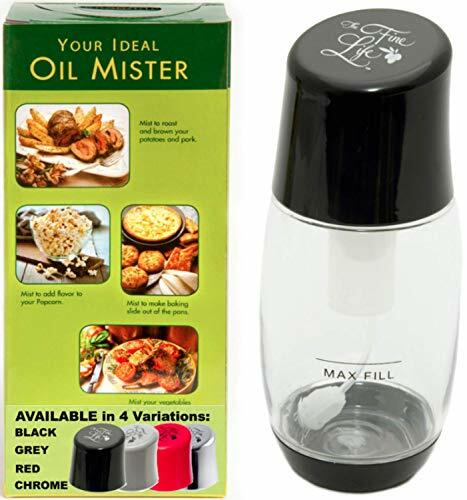 Your mister will work great with any oils that have a high smoke point. This means the oil will withstand high temperatures before burning. Avocado oil has a high smoke point of 570 degrees and gives food exceptional flavor. Other good choices include light olive oil (468 degrees), refined coconut oil (450 degrees), and peanut oil (450 degrees). You’ll find that Bertolli brand oil and grapeseed oils are reliable. The ability to spray oil goes beyond cooking with your air fryer. 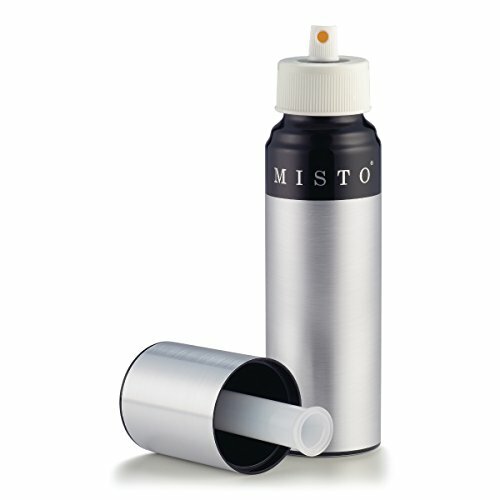 Products like the Misto let you spray baking pans and skillets or prep meat for the grill. A spray of oil on steak or chicken will stop sticking and enhance flavor. You’ll be able to reduce the amount of oil in a pasta salad while still getting a flavorful coating on everything. Other liquids work in the misters too. Fill it with juice, water, or vinegar and spritz foods to add flavor. Water spraying could be very useful for sealing the edges of pastries before baking. Cooking sprays typically contain corn, soy, or canola oils. These come from crops that are almost always genetically modified to withstand pesticides. Consuming GMO oils means you’re putting food with chemical residues into your mouth. Cooking sprays rely on petroleum and natural gas derivatives like isobutane and propane to expel the spray. Chemicals in commercial oil sprays can dissolve nonstick surfaces or leave sticky residues on pans. Oil misters are a essential accessory for cooks using air fryers. You’ll get crunchier fried foods while still maintaining precise control over oil use. Your air fryer pan will always get completely oiled, which solves the problem of sticking foods.